to break the ice and boost enthusiasm globally! 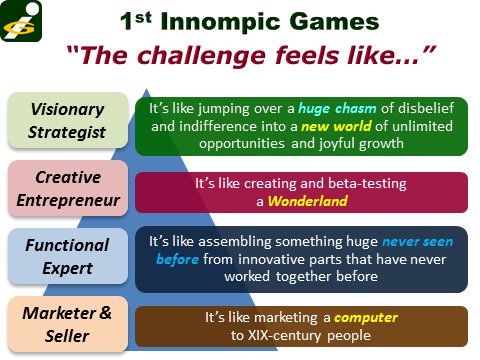 Innompic Games is not a 'Blue Ocean', it is a 'BLUE PLANET' strategy! Invent a radically innovative component or a sub-system for each big challenge and prepare it for implementation: create the name, vision, value mantra, slogan, and weighted guiding principles, prepare a product presentation and an envisaged success story. during the first half of the Day 1. 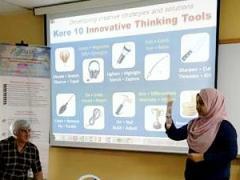 Actators (active spectators) will be engaged during various Innompic entrepreneurial creativity contests. Innompic Teams will perform the Innompic song 'I Have a Difference To Make!' jointly at the beginning and the closing of each day. Presentation of the Big Challenge 1 "World's Best Innovation City"
Surprise Challenge 1 announced. Innompic Teams brainstorm and present their solutions. Surprise Challenge 2 announced. 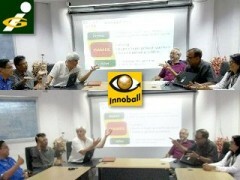 Innompic Teams brainstorm and present their solutions. 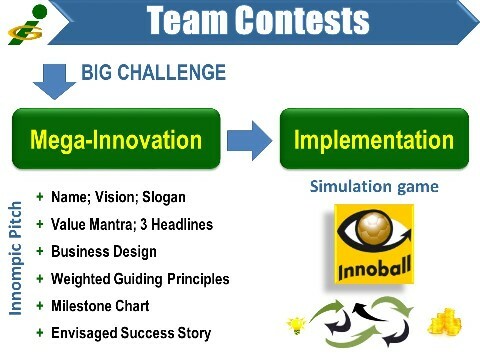 Presentation of the Big Challenge 2 "3rd InnompiC Games 2019 Engage 1 Billion People"
This in not an IT challenge, though you may address the IT part of it if you wish to. This is primarily people-oriented challenge. It is about how 3rd Innompic Games could create such a great value for diverse groups of people around the World and market this value so creatively and skillfully that 1 billion people watch 3rd Innompic Games and engage in various contests and activities. Starting small, but thinking HUGE! 4 teams only will participate in the 1st Innompics.